Inspiration. We all need it, we all use. Being inspired is one of the most beautiful things because it exemplifies the "ah hah" moment we all so desperately crave. That desperation may not be evident consciously but it is there. We all want a sense of direction and purpose in life and for so many of us we can't find it every second of every day. Recently I've been incredibly inspired by the will to live another day. Companies such as TWLOHA and So Worth Loving have lit a fire in me that, to be honest, I had been lacking for the better part of my first year of college, i.e. the supposed "best time of my life". So with that, this season I'm all about the simple yet important things in life that inspire you and I daily. Here are a few books (or inspirational journals, if you'd like) that if nothing else will brighten your day just a little bit when you read another page each day. Saying "YES" is something we all need to do a little more of every now and again. The battle is never over. Even when it looks grim, there is still hope. If you can dream it you can do it, as another great visionary once said. What you should start today, because now's a better time than ever to be happy. Custom anything is my cup of tea. I prefer to have things personalized just the way I like it instead of having to compromise even just a little bit. Pair that with a weird interest in quirky, cool nail polish names and I've got another set of Pretty Please nail polishes. My very first bottle of Pretty Please nail polish in a rich, medium pink color was aptly named "A Glamorous Revelation". Then when Christmas came around and Pretty Please had a sale after appearing on Good Morning America, I decided to buy a few more bottles giving them oh-so-original names: "A Glamorous Revelation <3" and "101 in 1001 <3". They sound like a third grader chose them, but then again, I am practically a third grader in my mind so the titles are fitting. On top of getting to choose my own childish names for my new nail polishes, I ended up choosing the perfect color combo of ultra-light pastel pink and densely glittered silver. A pet peeve of mine is when glitter nail polishes have such little amounts of glitter that you have to apply several different coats in order to get the full effect. With the Pretty Please silver glitter, one coat is more than enough to adequately glitter-ize your nail. Add the intensity of one glittery accent nail to a delicate pale pink and you've created an Insta-worthy manicure. Emily Weiss would definitely be proud. Rumi Neely has been a little obsession of mine since I inadvertently discovered blogging five or six years ago. She, along with Jane Aldridge and the Glamouri and Emily Schuman of Cupcakes and Cashmere, was featured in a Teen Vogue article talking about the booming business of blogging. Since then her style has been refined to an ultra specific aesthetic of simple luxury. Her style has now been transformed into the luxe clothing line Are You Am I (aka AYAI) that offers classic pieces in high quality fabrics and designs. Something as simple as a bralette or choker from AYAI is made of hand cut lace from Los Angeles hipster artisans or high quality leather from SoCal craftsman. The lingerie inspired design of each piece has a certain risque casualness that I find myself falling in love with every time I see anything from the collection. The insane price tag on every item is enough for me to enjoy admiring AYAI from afar, but there is also a sense of wait-and-reward that could come from splurging on a great piece of clothing designed by one of the most influential bloggers in fashion history. Glossier just announced the official release date of their highly anticipated, yet-to-be-named cleanser and Twitter seems to be happily buzzing with the news. I've been waiting for the Glossier cleanser since the first hints of it were dropped early last year and cannot wait until I have the chance to try out the many new things Emily Weiss and her team have to offer in 2016. Thanks to a rather large, white bearded man who visited me on December 25th, I now have all of Glossier's current products, so my Glossier collection can be considered complete... for now, at least. With that I've decided to dig into my makeup bag and write about my Glossier experience, from the very first product I purchased back in August to now -- five months deep and still going further down the rabbit hole. aka A full review of all things Glossier in which I'll write about every single item they currently offer on their website openly, honestly, and hopefully concisely. By now you've probably already decided to stop fighting off the opposition and allowed Glossier to claim its title as a "cult classic" brand. Premature, I know. But the cult-like following behind Glossier's products and its brand is undeniably amazing and will likely lead to years of Glossier success. 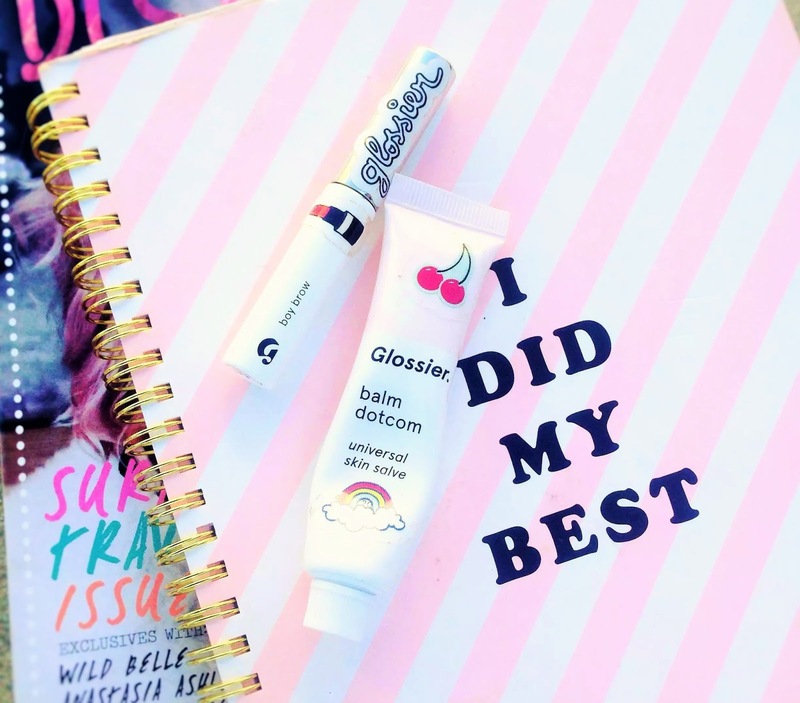 Since its launch, there have been a multitude of websites writing and raving about all things Emily Weiss and Glossier while a handful of loyal Into The Gloss fans were left unimpressed. 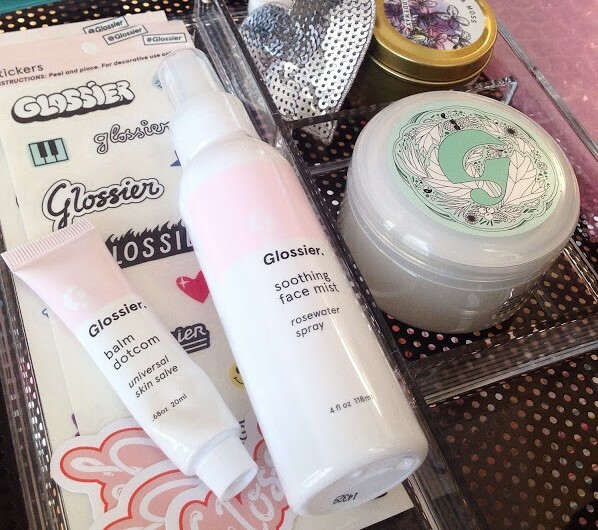 But as neither an ITG reader nor skincare/makeup aficionado, I fell in love with Glossier as one would fall in love with any brand he or she happens upon while browsing Twitter -- no preconceived notions and virtually no expectations. So this will pretty much be an all-inclusive review of the real Glossier. Perfecting Skin Tint $26 ( 3 out of 5 stars): The most recent of my Glossier purchases, the Perfecting Skin Tint has only been a part of my makeup bag since Christmas. Over the past three weeks I've tested it with my beauty routine a dozen different ways and have come to two basic conclusions -- 1) you CAN get decent coverage if you get the right shade [I suggest going one shade darker if you're caught between two since I've noticed it appears lighter on the skin once it's dried/settled than it does upon first application] and layer it on correctly [the best way to do this is to apply one layer as you would typically, wait a few minutes for it to dry, then repeat the process with a second and third layer while adding 'spot coverage' to dark marks & trouble areas when necessary] 2) the bottle is so very very small and the product is so thin that I don't believe I can make my bottle last more than a month or so if I were to use it daily. The coverage is nice for it being a perfecting skin tint, but not nearly worth a monthly purchase of $20+ which makes the greatness of the quality almost irrelevant if I can't afford to use it whenever I'd like. Priming Moisturizer $25 (2 1/2 out of 5 stars): Though the results aren't that bad, the Priming Moisturizer is by far the most disappointing product in Glossier's fleet. There has been so much hype around the Priming Moisture by Glossier enthusiasts and skeptics alike. Overall, it did not deliver as the "best product Glossier has every created" and it fell short at being a moisturizer. 1) The moisturizer itself was thin and not very moisturizing when worn sans makeup unless it was applied exactly as directed (up and out!) 2) even with makeup, at times it felt sticky which didn't make me feel "primed for my day" 3) because of its thinness when applied correctly it can be the perfect primer for the Perfecting Skin Tint & similar products, but that also means that the quantity of product in each bottle won't last long. When used daily as part of a beauty routine $25 for 1.7oz may last you eight to twelve weeks which may not seem that bad initially but is an absurd amount to pay for an unreliable product. Balm Dotcom $12 (3 1/2 out of 5 stars): Honestly, the Balm Dotcom started out sooo well. I ordered my first tube in August and it was miraculous. After just a little dollop each morning, my lips felt eternally moisturized. The dry skin I'd been dealing with since elementary school seemed to disappear within minutes... But then winter came around. Up until the past month, Balm Dotcom was a solid 5 out of 5 stars, but the constant need to reapply during the colder months has burst my fantasy lip salve bubble. Long story short -- Balm Dotcom from April to October is a "yes" but November to March is an iffy choice. Mega Greens Galaxy Pack $22 (3 out of 5 stars): Once Glossier released its first masks, the Mega Greens Galaxy Pack was the definite first choice for me. I got my first tub just a few weeks before I started school and absolutely loved slathering it on my face every weekend. The major shortcoming of Mega Greens is that it is 'gunky' to wash off. While it's on your face it dries almost as if it were a lotion you didn't rub in (rather than staying wet or drying like clay as a typical mask would) therefore when it's being washed off it does so as if it were lotion being rinsed of your face. Just picture that experience and decide if that's an overly complicated mess you wouldn't want to deal with or if it's a minor fault in an otherwise amazing product. Moisturizing Moon Mask $22 (4 out of 5 stars): Even though I originally thought the Mega Greens Galaxy Mask would be my favorite between the two, the Moisturizing Moon Mask became my obvious favorite once I bought it and used it for the first time. The results were apparent after just one use and the consistency of the mask felt like heaven... Well more like a fluffy pillow caressing my face, but you get the gist. However, even though the consistency is the best part of the Moon mask, it's also the worst. Because of its 'fluffiness' the number of masks you can get out of each tub is pretty saddening. The Mega Greens Galaxy Pack can provide twice as many masks as the Moisturizing Moon Mask so if you buy them together and use them in conjunction you'll be left a little disappointed when your Moon Mask is all gone but you have plenty of Mega Greens to go around. Boy Brow $16 (5 out of 5 stars): Hands down the best product Glossier has to offer in terms of quality, usability, price, and it-does-what-it-says-it'll-do reliability. The Boy Brow has all-day lasting power, is formulated with pomade which leaves your eyebrows feeling soft and nourished not crunchy and dirty, and is easy to use every single day. As Emily Weiss has said, "it's a game-changer." What more can I say? Boy Brow is a definite Glossier go-to. A Third Year of A Glamorous Revelation! Hello again... As I enter into the third year of A Glamorous Revelation my perspective has shifted quite a bit. Blogging has been so different than what I thought it would be when I saw Courtney Loves Dallas (the show that made me want to start a fashion blog). Now after two years of being on and off, I'm making a concerted effort to make this website into 'something real'. For the first time ever I am TRULY deciding on quality over quantity (which means fewer posts per week, but waayy more consistency than you've been seeing lately) in hopes of taking AGR to what I believe is the next level. And now... Yesterday I visited The Glamouri and was completely amazed by the transformation it's had since I first clicked through back in 2010. It has become a bonafide online fashion and lifestyle magazine that is practically what my fashion-y stylish fabulous dreams are made of. That was enough inspiration to get me back in my game and start planning what I'm going to be doing next on my own blog. So now that I'm done fangirling like a girl from The Hills, I can refocus and get myself together to.